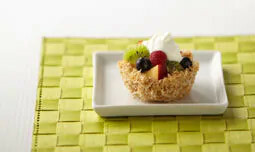 Kellogg's® Frosted Mini-Wheats® Bite Size cereal makes delightful baskets for serving fresh fruit. In medium bowl stir together KELLOGG&rsquo;S FROSTED MINI-WHEATS Bite Size cereal, coconut and butter. Line six 2 1/2-inch muffin pan cups with foil liners. Use back of spoon to firmly press cereal mixture on bottoms and up sides of prepared cups. Bake at 350° F about 10 minutes or until crisp. Cool completely in cups. Remove from cups. Peel foil off baskets. Fill each basket with cut up fruit. Spoon yogurt on top. Serve immediately.